The recipe is made over 3 days and only needs a little time at each stage. It’s a very forgiving and flexible method. If you work weekdays, you could start on a Friday evening and have beautiful bread for Sunday lunchtime. The 3-day method allows the dough to slowly develop good structure and flavour without being too sour. I (mainly) use a small wholemeal rye starter. There’s a great post here from Weekend Bakers which shows you how easy it is to make. I find this uses less flour and it’s very responsive. If I screw it up, I can make another starter from scratch in a couple of days with no problems. To keep things simple, I use equal weight of flour and water when refreshing: so it’s a 100% starter. 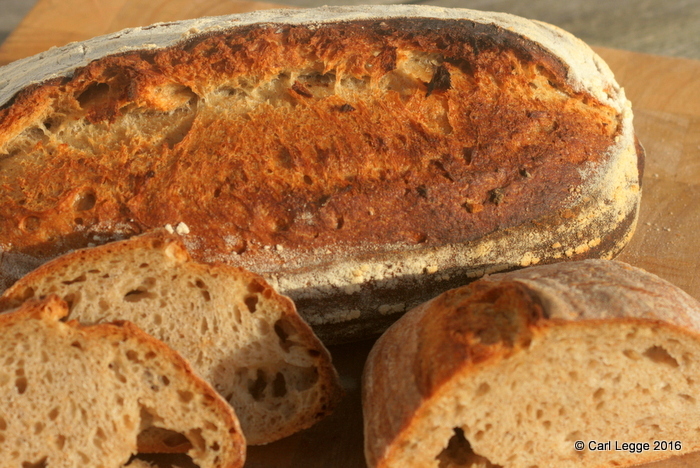 You could replace the wholemeal rye flour with any wholemeal flour. I find the rye is very good as a starter and gives an excellent flavour to the finished bread. I normally make 3kg of dough at a time for 4 loaves to make the most of a hot oven The recipe here makes about half that, for two loaves. Just scale up/down the ingredients pro rata if you need to. I use digital scales for accurate measuring, it really does make a difference. Finally, the flour I mostly use is from Shipton Mill: their organic dark wholemeal rye and untreated organic white flour No. 4. In a small bowl mix this all together and cover with a lid, cling film or a clean cloth. Leave in a warm place. The following morning, you should have a little bowl of bubbly flour. In a bowl of about 2-3 litre capacity, mix all the ingredients together. A Danish dough whisk is just perfect for this. A spoon or fork will also work… Cover the bowl and leave in a warm place until the evening. Ideally the poolish will have at least 6 hours to stand, more is not a problem. You should end up with a bigger bowl of gently bubbling flour. In the early evening, add the other ingredients to the poolish in the bowl and mix well to form a ragged and sticky dough. Cover the bowl and leave in a warm place for about 1 hour. Then fold the dough. The dough will be slighty more sticky than in this video. Just keep the surface and your hands well floured and you’ll be fine. I fold 3 times in total at roughly 1 hour intervals. Pop the dough back in the bowl, cover and leave in a warm place after the first two folds. After the third fold, pop the dough in the bowl, cover and put in the fridge overnight. Bakers call this ‘retarding the dough’. It allows the dough to slowly develop a good flavour. Different flavour giving compounds in the dough work best at these lower temperatures to make the rounded flavour of the sourdough. Take out dough and divide it into two. In a warm place, allow the dough to rest and warm up for about 30 minutes. Shape the dough and prove 1-3 hours. See these videos for shaping ideas. 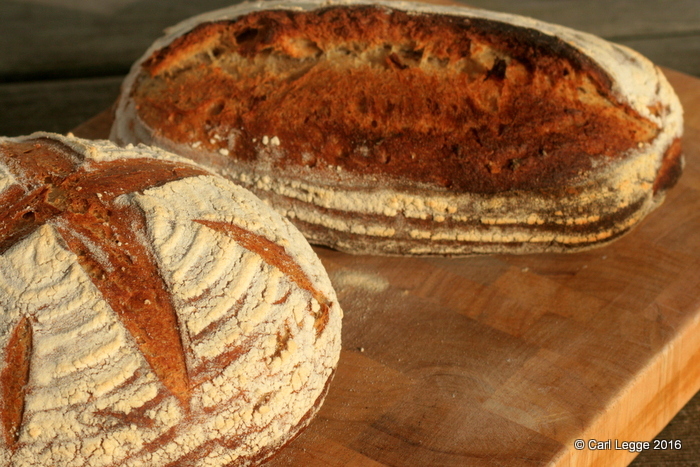 How to simply shape bread to make rolls, a batard, a boule or round loaf and a rectangular loaf. Once you’ve shaped the dough, put it into a banneton or just onto some baking paper, cover and allow to prove for 1.5-3 hours. The dough should increase by 30-50% and still be springy to the touch. While the dough proves, heat your oven to 240°C. I bake on a granite baking stone which gives a good bottom to the bread. Once the dough is proved, slash the top of the dough to give it somewhere to expand through (and to look pretty). Then bake for 15 mins with a tray with some boiling water in it placed at bottom of the oven. The water will help give you a nice crisp crust. Then remove the water tray and bake for another 30 minutes at 190-200°C for 30 mins. Take the bread out and allow it to cool on a rack. 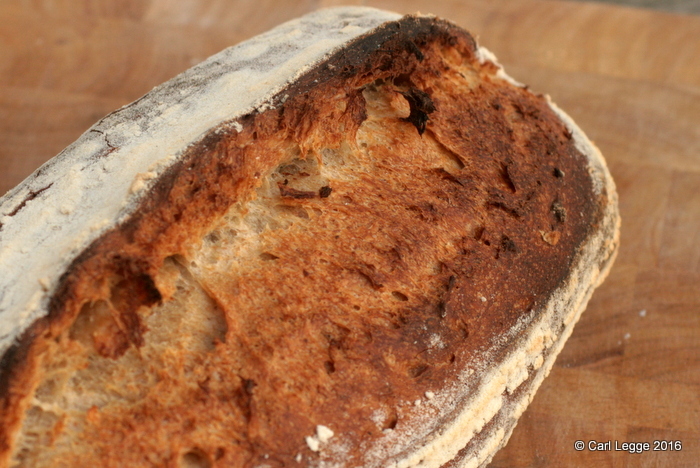 Wait a while and listen to the crust crackle and ‘sing’. And enjoy. Thank you Carl, for the videos too! sorry for pestering for the recipe but glad you posted this. All the best bread making! Wow! Now that is inspirational! I have a baking stone which was made specifically for my oven. This make s want to put it into use. Thanks so much for sharing this.